This is a rectangle Allis-Chalmers porcelain sign. 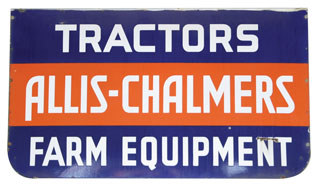 This particular Allis -Chalmers sign is navy and orange with white text. It reads, “Allis-Chalmers, Tractors, Farm Equipment” and has no other design.